Chlorella, the freshwater micro-algae, is not called a superfood for nothing. The la undry list of chlorella health benefits is crazy long. It is densely packed with protein, vitamins, minerals, antioxidants, zinc, magnesium, iron, phytonutrients, phosphorous, amino acids, chlorophyll, beta-carotene, calcium and potassium. With so many and such powerful nutrients, chlorella health benefits are also plentiful. If you want to try chlorella, check out our top 3 recommendations for chlorella supplements. On the top of the list of chlorella health benefits, is its ability to cancel out the effect of heavy metals in our bodies, like mercury, lead, cadmium, etc. How this works is that chlorella binds itself to these harmful metallic toxins in our bodies and prevents them from being absorbed back into the system. Another area where detoxification by chlorella comes into play is if you’re undergoing radiation and chemotherapy treatments. The high amount of chlorophyll in chlorella removes the radioactive particles resulting from these treatments. It also protects your body from the ultraviolet radiation by maintaining the body’s immune system, which typically becomes extremely weak because of radiation and chemotherapy. And if you’re wondering how can you have metal in your body, there are many possible sources – mercury-based teeth fillings, chemically-induced foods, chemical waste that is dumped into the air and water, contaminated water supply – the list is endless. Many times, we are unaware of how these poisons enter our bodies! 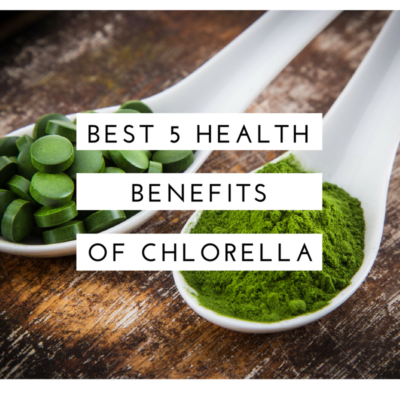 The ability to improve our immune system is another top health benefit of chlorella. Chlorella helps in soothing digestive problems and relieving constipation. It enhances the production of good bacteria, healthy flora and probiotics in the digestive system. It enhances Natural Killer (NK) cell activity, thereby strengthening the immune system. NK cell is a type of a white blood cell and is a part of our inherent immune system. Another top health benefit of chlorella is that it can help fight, or even prevent cardiovascular disease. There are actually multiple chlorella benefits that together help in this cause. Primarily, chlorella aids in reducing high blood pressure, lower cholesterol and also in lowering your blood sugar level. As a combined benefit, your heart is better protected. With its naturally detoxifying nature and ability to boost the immune system, chlorella is an inherent anti-carcinogenic agent, making this a highly-rated chlorella health benefit. Along with these properties, chlorella is quite rich in carotenoids, which are known to prevent oxidation – oxidation is one of the leading causes of cancer. Another health benefit of chlorella is that it helps to stabilize your endocrine system. A balanced endocrine system proves conducive for weight loss. Chlorella also improves circulation and results in more energy. And while you lose those pounds, your skin can also look more youthful and healthier, thanks to chlorella. With its antioxidants, chlorella can prove anti-aging too as it helps fight the damage done by free radicals and helps restore healthier skin. Added to this, is the fact that chlorella divides rapidly thanks to its CGF, or Chlorella Growth Factor – this aids and skin regeneration and cellular reproduction.